First wash the mutton meat (Kemah) properly with fresh water. Then mix all(papaya paste, onion paste, ginger paste, garlic paste, coriander paste, chili powder, chana powder, cardamom powder ,salt ) the ingredients very well with the mutton Kemah and refrigerate for 3-4 hours or for overnight. Then after 4 hour , take out the mutton Kemah mix out of the refrigerator and make medium sized tikkias out of the mixture. 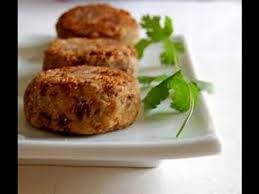 Now make small patties of the prepared mix and deep fry in hot oil in 20 minutes on each side. Make sure the Kemah is cooked both sides of the kabab gets golden brown in colour. And now serve the Galouti Kabab hot with sauce, lemon ,onion rings, and paratha.